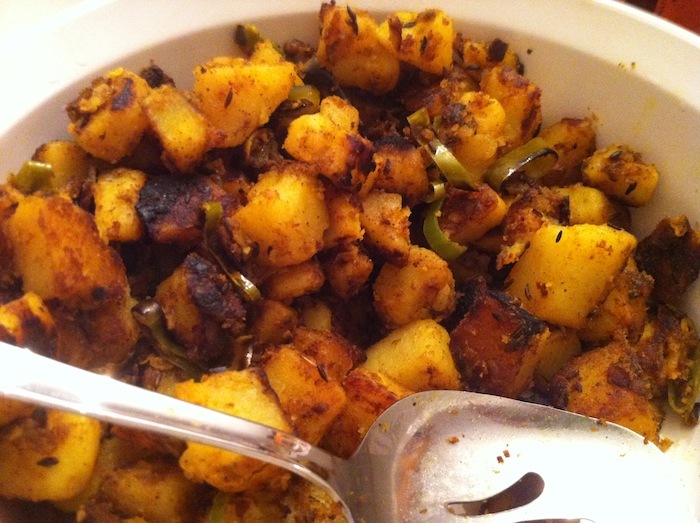 With a slight Indian twist, this dish is sure to please spud lovers. Cumin is a delightful spice, slightly smokey with good rich flavor, it pairs wonderfully with potatoes. This makes a great dish and adding a nice spiced touch to your usual side. Add cumin seeds and when the start to crackle add the potatoes and chilies. Fry for a minute, then add turmeric, chili powder and garam masala, mix well. Add salt and fry until crispy brown, don’t stir too frequently so that the potatoes get a nice crust. Taste and adjust seasoning as needed. Remove from heat and toss with cilantro. Hey this looks great. Hope you enjoyed it!